Chamfer: The surface produced by bevelling off a square edge or corner equally on both sides; if made concave, it is called a Hollow or Concave Chamfer. Using a Router Bit, a Shaper Cutter, Chamfering Plane, Spokeshave, Draw Knife,to remove the sharp corner from an edge -- for example, to soften a large squarish leg on a table, the four corners are "chamfered" -- an action that improves the appearance of some work. It is usually made at a 45-degree angle with the surface or edge of the workpiece. Also to cut a furrow in, as in a Column; to Groove; to Channel;to Flute. Also, sometimes Bevel. "Chamfer, the arris of anything originally right-angled cut a slope or bevel". Source: Joseph Gwilt, et al The Encyclopedia of Architecture, Historical, Theoretical, and Practical New York : Crown, 1867; reprinted 1982, page 28, as cited by OED. Chamfering and Beveling: When the chamfer is planed along an edge that runs with the grain, it is only necessary to set the plane to a small cut, and holding it on the angle of the chamfer, to plane along evenly until the desired portion of the edge has been removed. It is extremely important that the plane blade be perfectly sharp. The chamfering of end grain requires a special technique. The plane must be held in a paring position so that it will shear off the wood partly with the grain, and not splinter the grain at the end of the stroke. This type of chamfering is most successfully performed by working from both sides toward the middle so that the plane blade never actually passes entirely across the edge. The small block plane is favored for end-grain chamfering, especially when there is a narrow edge to be planed. 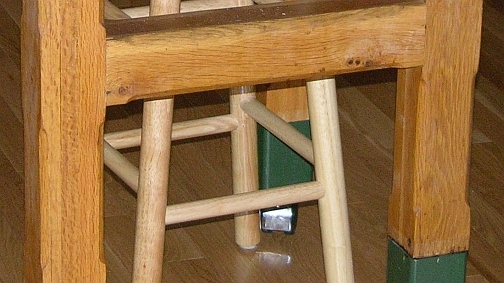 (On left is example of chamfering on legs and Stretchers of my chopping block table. Sources: Joseph Gwilt, et al The Encyclopedia of Architecture, Historical, Theoretical, and Practical New York: Crown, 1867; reprinted 1982; W.F.M. Goss,Bench Work in Wood: A Course of Study and Practice Designed for the Use of Schools and Colleges, sections 222 and 223; Reprinted in 1997 by the Midwest Tool Collectors Association; John Gerald Shea,Woodworking for Everybody New York: Van Nostrand, 1970.